Networked device monitoring, integrating graphs, alarms, GPS tracking, notifications and actions onto a rich graphical representation available through a web browser as well as a dedicated application. Wizard Based, including start-up wizard used to scan and draw a network in a few steps. Extreme flexibility allows alarm, notification & action components to be extended by the end user to facilitate the monitoring of any networked device. ...... can be extended by the user to perform whatever task is required on an alarm state change. Drawing elements have been kept as simple as possible enabling for simple, quick and neat representations of the monitored environment to be setup. Optional task bar band and alerter components extend the interface onto the desktop. Devices with a GPS attached can have their location tracked and recorded on a map background. Net-Probe offers real time monitoring of any network connected device. It does this through a rich graphical interface available through a web browser as well as a dedicated application. Items can be monitored in three ways, using graphs, alarms and GPS tracking. A suite of ten top quality networking tools, including Ping, Traceroute and DNS. Track of your internet time with warnings if wanted, see your actual data speed. 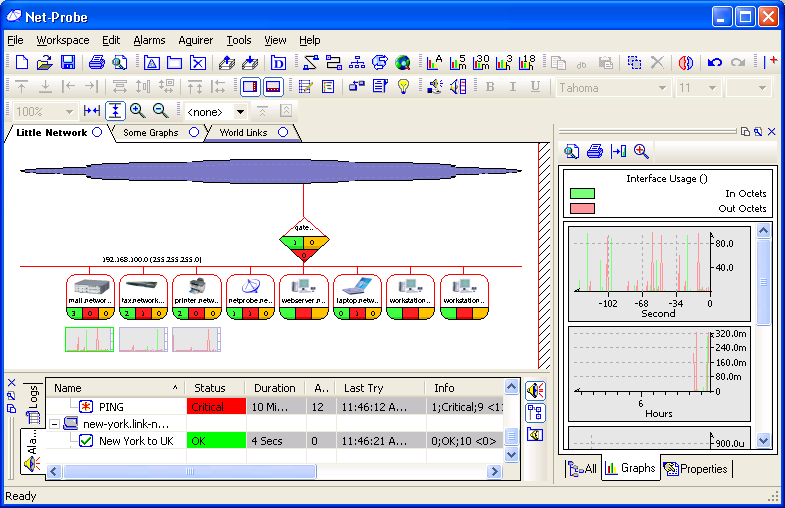 Isolate faults and simplify processing of diagnostic data. A tree orientated, optimized, graphical representation of a SNMP Walk output. Download Vphonet for free. Enjoy amaizing voice-video-sms-chat features. Net Meter is a powerful and easy-to-use bandwidth meter. Qweas is providing links to Net-Probe 3.0.1 as a courtesy, and makes no representations regarding Net-Probe or any other applications or any information related thereto. Any questions, complaints or claims regarding this application Net-Probe 3.0.1 must be directed to the appropriate software vendor. You may click the publisher link of Net-Probe on the top of this page to get more details about the vendor.